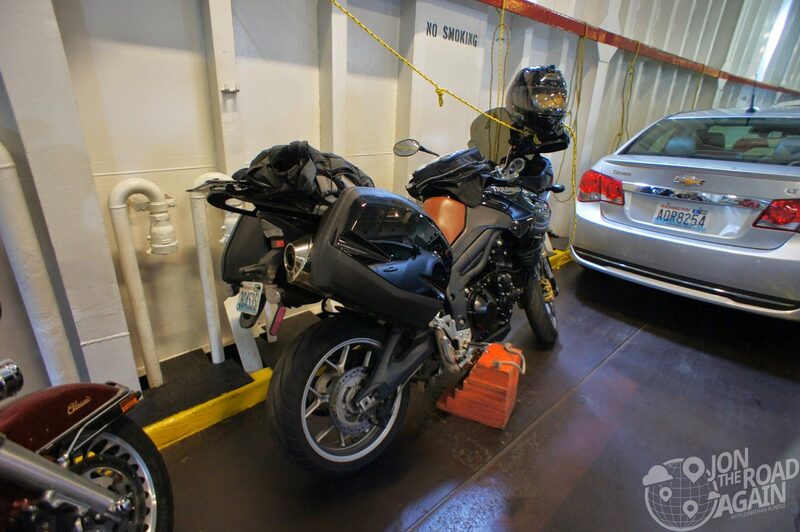 The Black Ball ferry is perfect for your motorcycle trip from Seattle to Vancouver Island. Why? Because you’ll get to rip up and down Hurricane Ridge Road on your way back! Let’s see what it’s like to make our way to Canada on this private ferry line. As someone who has been on many Washington State Ferries, this boat rocked – and by that I mean swayed side to side quite a bit. Which is why as soon as you’re on the boat, motorcyclists are told to tie up and chock. I helped another rider chock the correct side of the bike (they had the chock on the side stand side, which is incorrect). You’ll also want to tie the provided rope to your handlebar to make sure it stays upright. There were times during the crossing where I wondered if I would return to a bike on it’s side, but luckily we all made it through rubber side down. Unlike Washington ferries, motorcycles didn’t get any first-on first-off privilege. That means choking down some exhaust fumes as you wait on the boat and then choking them down some more as you wait at the passport check for entry into Canada. For entry to the US, they check your passport before you get on the boat, so you can make your way off the boat as soon as the doors swing open. The journey covers 22.5 nautical miles (26 miles) and takes about 90 minutes. The boat, M.V. Coho, can hold 115 vehicles and up to 1,000 passengers. The ride is pretty comfortable, but the day was very calm. I would imagine there are some stormy days where the ride is not so leisurely. She’s loaded with a full cafeteria serving hot and cold food and refreshments, etc. etc.—but you’re going to want to make your way to the sun deck and enjoy the view. If you plan on making this crossing, reserve in advance. I didn’t see anyone get turned away, but it seemed like it could be an issue – even for motorcycles. The fare for motorcycles is around $40 for a one-way ticket and includes you and the bike. You’ll be charged additionally for a passenger. 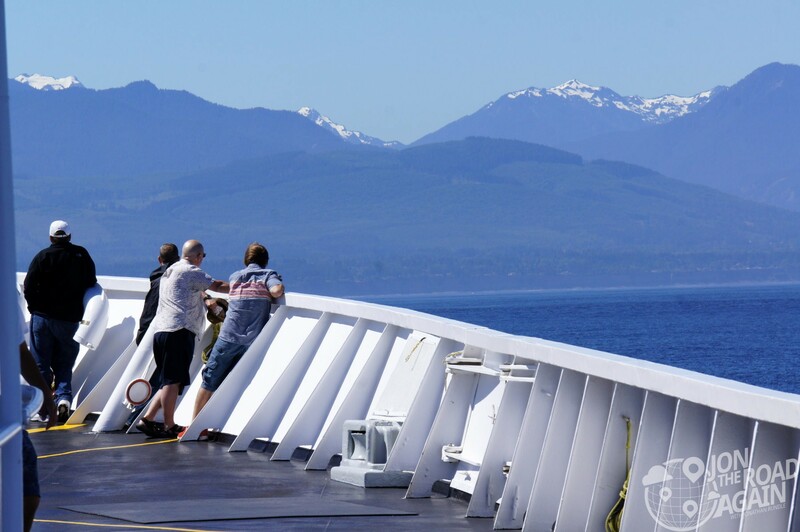 Vehicles are advised to arrive 60 minutes ahead of time on the Port Angeles side, 90 minutes ahead of time in Victoria. Get what you need from your bike before you head up to the passenger deck. 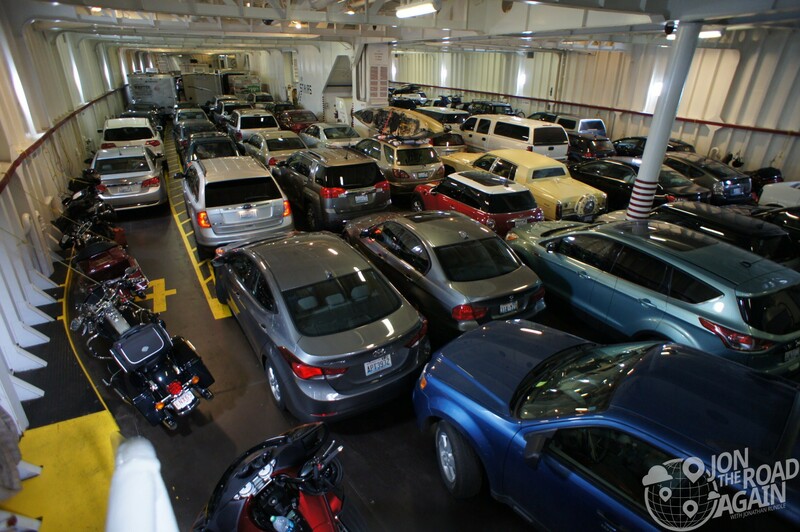 Entry to the car deck is not allowed once underway. Fun fact: Black Ball offers a free round-tip walk-on fare if you travel on your birthday and return within 7 days.